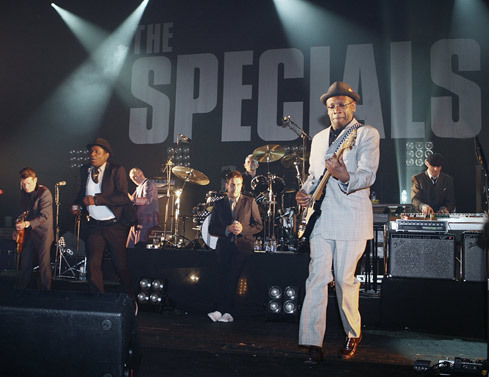 The Specials plot ‘final’ dates of 30th anniversary reunion tour of U.K.
Reunited 2 Tone ska legends The Specials have announced a second U.K. tour this fall as part of the band’s 30th anniversary celebration — a 13-concert run being billed as “the final dates” of the group’s reunion tour. The Specials — minus founding songwriter/keyboardist Jerry Dammers — performed together for the first time since 1981 when they appeared on the U.K.’s “Later with Jools Holland” in April (see video here), before embarking on a sold-out run of British dates. Comprised of Terry Hall, Neville Staple, Lynval Golding, Roddy Radiation, Sir Horace Gentleman and John Bradbury, the band now will play 13 more shows in November, beginning in Cardiff and wrapping with a pair of London extravaganzas. Are there even ANY rumors about a US tour by chance? PS: Keep up the great work! No, haven’t seen any real speculation about U.S. dates — although we can hope.